Oh, those little smiles. Even when they’re up to mischief, your children’s smiles make you smile. To keep those precious smiles happy and healthy, it’s important to take care of them. At Cosmetic & Family Dentistry of Weatherford, we provide the services that you want and need for your children. Bring your kids to the children’s dentist Aledo, TX, and Weatherford, TX, depend on for professional and gentle care. Truth be told, you are your child’s first children’s dentist. The cliché is true—monkey see, monkey do. 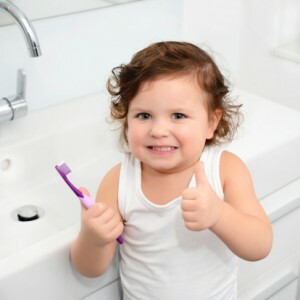 When your children see you brushing and flossing your teeth every day, they want to do the same. So why not make teeth brushing a family activity? Start and end the day with this activity and you will set your children on a path toward a lifetime of good oral health. The other step that’s necessary for a lifetime of healthy smiles is regular dental checkups at Cosmetic & Family Dentistry of Weatherford. Around the time that your child turns two years old, Dr. Deborah Romack and Dr. Garrett Mulkey would like to start seeing your children in the office twice every year. Just like adults, children can have cavities and gum disease, and they are even susceptible to sleep apnea, snoring and teeth grinding. With biannual dental checkups, we can more closely monitor your children’s oral health and spot problems early. Of course, if there is anything of concern, then we’ll want to treat quickly. Dr. Romack and Dr. Mulkey are particularly interested in treating young children who may not have room for their erupting permanent teeth. To this end, Cosmetic & Family Dentistry of Weatherford provides orthodontic treatment, which is a common need for children who develop bite problems. To schedule an appointment with the children’s dentist Aledo, TX, and Weatherford, TX, count on, call Cosmetic & Family Dentistry of Weatherford. We gladly serve patients from the surrounding communities of Brock, Millsap, Springtown, Mineral Wells, and beyond.